Registry Vaccine is a powerful computing diagnostic and optimization utility that is designed to fix Windows Errors, and Registry inconsistencies - thus enhancing the stability and performance of your PC... Delivering total control of your PC back to you. Registry Vaccine uses a robust registry detection algorithm to quickly identify missing and invalid reference calls within your Windows OS registry. Many of these problems are caused by debris left-behind after the un-installation or incorrect removal of software applications, by missing or corrupt hardware drivers, or abandoned startup programs. A few simple steps with Registry Vaccine will scan your registry for any invalid entries and provides a list of the registry errors found. You will then have the option to clean each item individually or automatically repair all registry errors. Registry Vaccine also creates a backup of all repairs made so that you can recover from any changes if needed. Lower the risk of Virus, Worms etc. Registry Vaccine is powerful, yet simple to use. Its Windows Interface has all the functionality and performance required in todays complex computing environments. Detect and safely repair invalid entries from your Windows Registry that are a common cause of Windows crashes, error messages and reduced system performance. Over time, invalid entries and orphaned shortcuts can accumulate within the Windows Registry as a result of uninstalling or incorrectly removing software from your system, having missing or corrupt hardware or software drivers and deleting files referenced by shortcuts. Using Registry Vaccine, you can safely clean and repair invalid entries from your Windows Registry within a few simple mouse clicks and helping you to improve your system's stability and performance. Scans your hard drive for invalid program shortcuts. Registry Vaccine provides you with complete flexibility in scanning specific locations of your hard drive for invalid program shortcuts. It also provides you with default paths to locations on your computer's hard drive, where invalid program shortcuts are likely to accumulate. The trial version of Registry Vaccine displays all errors for all scanned areas. If you are using an unregistered version of Registry Vaccine, you are able to scan all sections of your Windows Registry as well as view the details of all the errors detected in a scan. Items which cannot be repaired in the evaluation version are also displayed. The automatic creation of Windows Registry backups. When you execute the Repair function on the scan results screen, Registry Vaccine automatically creates a backup of the Windows Registry . This backup will reinstate the changes made to your Registry when you executed the Repair function. The ability to set Registry Vaccine to scan automatically at startup, for continued system optimization. Registry Vaccine can be configured to conduct a Quick Scan or Full System Scan every time you start your computer. By doing this, you can help to keep your system stable and running efficiently. In some instances, uninstallation of applications leave behind program shortcuts. 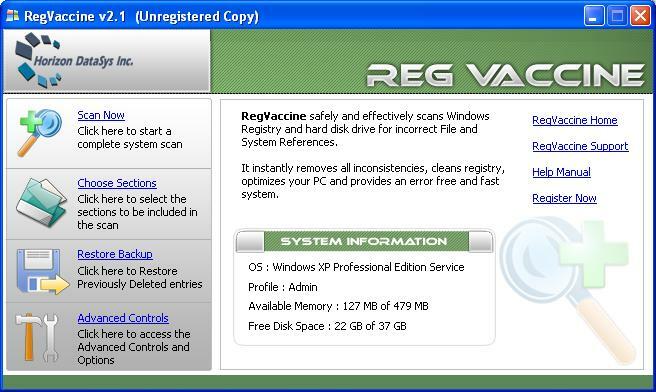 With Registry Vaccine you can easily identify which entires should and should not be present on your PC. BHO (Browser Helper Objects) Management. Browser helper object (BHO's); attach themselves to Internet Explorer browsers. Although most BHO's are safe, and usually chosen by the user, many BHO's are the root causes of Adware and spyware. Registry Vaccine puts the control back in the hands of the user. Allowing you to decide which BHO you want present on your PC. Most adware and spyware components start when your PC boots up. With Registry Vaccine's built-in Startup Program Manager. You can now view the applications that are launched during this critical time. Delivering 100 percent control of the PC back to the user. Unlimited free upgrades and e-mail technical support. When you purchase Registry Vaccine, you are entitled to free in-line upgrades of the product for one year after the purchase date. You are also entitled to unlimited e-mail technical support for all products purchased.